Honor has launched Honor Play smartphone in China. It has a 6.3-inch Full HD+ 19:5:9 display with a notch powered by Kirin 970 10nm processor with 4GB/ 6GB of RAM and 64GB of internal storage. It also has 4D gaming experience with real-time recognition of the game scene that vibrates the phone to intelligent match up to 30 different senses promising more realistic game scene experience. It also offers 7.1-channel 3D Histen audio experience in games. On Camera it has a 16-megapixel rear camera AI scene recognition that can detect over 500 scenes and the 2-megapixel secondary rear camera for portrait shots and a 16-megapixel front camera . Packed with a 3750mAh battery with support for fast charging. 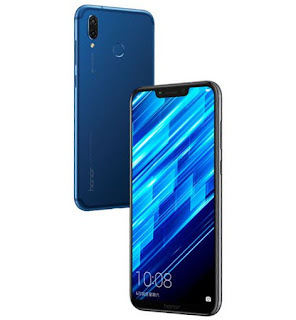 Honor Play comes in Black, Blue, Violet and soon in Red color priced at 1999 yuan for the 4GB RAM version and the 6GB RAM version costs 2399 yuan.